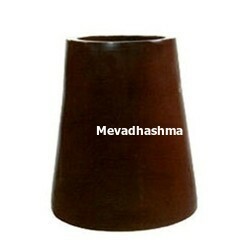 Mevadhashma was Established in 2007 with an endeavour to meet the growing demand for Electrostatic Precipitator Spares and Bag Filter Spares which is most important equipment in all major industry. We are engaged in offering a wide range of Porcelain Insulators and Wallthrough Bushings. The range of components includes ESP Conical Support Insulator, Cylindrical Support Insulators for ESP, Shaft Insulators, Wall through Bushings, Pin Insulators, Bus Duct Insulators and Suspension Insulators. Our Insulators are accepted confidently by many userends of ESP in the field of sponge iron, cement, paper, steel, power industry. 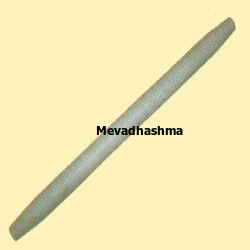 Mevadhashma offer higher alumina insulators dimensionally suitable for all oem major makes of Electrostatic Precipitator that is like AndrewYule, ACC, Thermax, Bhel, Alsthom, CVL, Cethar Vessels, Elex India, Ets-Elex, FlSmidth, AAF, Kirloskar AAF, VT Corp, Unicon. Our competency lies in offering our clients an excellent quality range of ESP Insulators. The offered ESP insulator is manufactured by using top grade raw material and the highly advanced technology. As well, our clients can avail this ESP insulator from us in a set of specifications as per their needs. Our ESP insulator is tested on various parameters so as to ensure its flawlessness. With the constant support of our dexterous crew of professionals, we are fulfilling the varied requirements of clients by offering High Voltage Porcelain Insulator. Our given range of high voltage porcelain electrical insulator is manufactured in adherence with predefined guidelines & advance technology. We offered this transformer rectifier set in different specifications to our customers. This transformer rectifier set is valued in the industry owing to its optimum quality. As a quality-oriented organization, we are focused to provide our clients excellent quality ESP Conical Support Insulators. 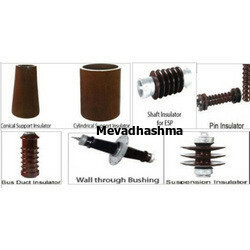 Provided insulator is offered in different specifications as per the requirements of clientele. This insulator is developed with the help of competent workforce using high quality raw material and leading technology. Offered insulator is high on demand among our patrons due to its indispensable features. We are instrumental in offering a wide gamut of ESP Cylindrical Support Insulators that have sustainability to operating temp above 500°c. The offered insulator is manufactured from the high-grade factor input as per with the industry norms. We offer this insulator in a number of specifications & also available in brown/white glaze so as to meet the demand of customers. Our quality controller inspects this insulator on different parameters in order to make certain its performance. Sustainability to operating temp above 500°c . High compressive and tensile strength. Suitable for high voltage ESP. We offer Wall Through Bushing Insulators suitable for Alstom, BHEL, VT Corp, Hamon, ACC, Flakt designed ESPs. Customized Designs are also on offer. 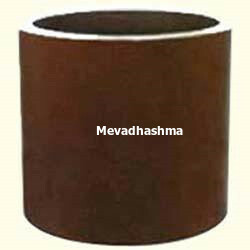 Mevadhashma offer FRP shaft insulators suitable for Thermax / ACC make ESP. Available in rod/pipe designs as per the drawing. Suitable for high voltage (above 120kv) and high temp (up to 250°c) applications. Made of high strength epoxy resin, available in red/white/golden/natural colors. We offer high quality range of Funnel Insulators for ESP. Owing to their high insulation capability, these funnel shaped insulators are widely used to serve various applications in electrical industry. Insulators are widely popular in the market and available at cost effective prices. We are offering a wide range of Electrostatic Precipitator Insulators. The insulators offered by us are used in ESP for sealing and high voltage insulation of the place. These insulators are used where the suspension of the hanged frame of discharge electrode gets via the casing of the electric field. We offer various types of insulators like cylindrical support insulator, conical support insulator, abnormal shape support insulator. Clients can avail these insulators in all shapes and sizes that are ideal for application in ESP. Working voltage varying from 72 KV – 100 KV, porcelain causing may be used in an environment under 250c. A white glaze or a brown glaze is used to brush the inside and outside surface of porcelain casing. Insulators with 85% alumna are extremely dense and does not absorb liquids or gases. Owing to their resistant to cm-attack by aggressive particulates and gases, these insulators are widely demanded by the clients. The two end surface has been ground. Clients can avail shaft and pin insulator of better quality.